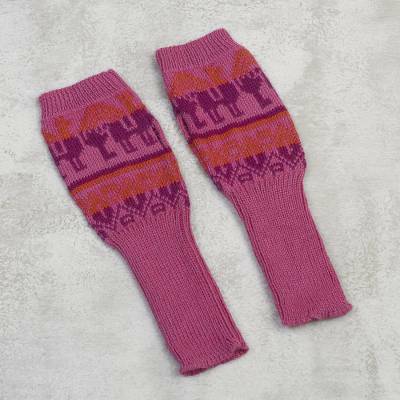 Knit Alpaca Blend Fingerless Gloves in Rose from Peru, "Alpaca Rainbow"
Against a feminine rose color, geometric patterns and the image of rainbow-backed alpacas are knit into a lovely pair of fingerless gloves. Working with over 100 local artisans, Peru's Alberto Caceres presents the comfortable gloves, which are crafted of alpaca blend yarns. You can find alpaca blend fingerless mitts 'Alpaca Rainbow' by Alberto Caceres in accessories categories such as Animal Themed Gloves, Acrylic Blend Gloves, Acrylic Gloves, Alpaca Gloves, Alpaca Wool Gloves and Alpaca Wool Blend Gloves. Enjoy exploring these sections for other Novica treasures.